The University of Minnesota has a unique history relative to advances in cardiovascular research, surgery, and the development of medical devices. The era from 1950 to 1967 was an incredible time of innovation at the University of Minnesota&apos;s Department of Surgery in the newly emerging fields of open-heart surgery and medical devices. There were many reasons for this, but most importantly: 1) the University had excellent facilities including a unique privately funded 80-bed heart hospital (the Variety Club Heart Hospital); and 2) the Department of Surgery was chaired by Owen H. Wangensteen, MD (Figure 1), a leader who "created the milieu and the opportunities for great achievements by many of his pupils" and was considered the "mentor of a thousand surgeons" . More specifically, Dr. Wangensteen encouraged his medical students, residents, and junior faculty to innovate and solve problems in different ways. He also believed strongly in collaborations with basic science departments, specifically the Department of Physiology. To that end, Wangensteen instituted a two-year research program for all residents; this surgical PhD program was the only one in the country at its inception, and students were required to take various advanced physiology courses. In the early 1950s, the innovative surge was credited to the fact that many surgical residents were returning from World War II, where they had experienced life and death situations when managing surgical field units. They had little or no fear of death and their generation was not afraid to "push the envelope" to help patients. By today&apos;s standards, these residents would be viewed as mavericks but, in fact, they had little to lose, not unlike situations they faced on the battlefield. Their heart patients were dying and/or had little chance of survival without the novel techniques that were successfully implemented in Minnesota. Figure 1. 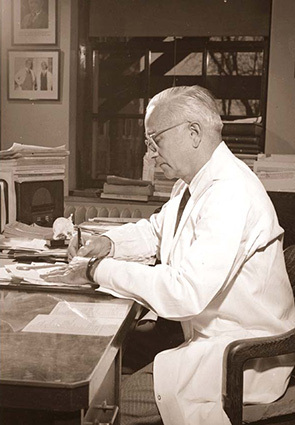 "The Chief" Owen H. Wangensteen, the youngest Surgery Department Chairman at age 31, served as chairman of the department from 1930 to 1967. One of these young war-experienced surgeons was C. Walton Lillehei, who returned to the University of Minnesota in 1950 to complete his surgical residency after leading an Army surgical field unit in both North Africa and Italy (Figure 2). Lillehei was very bright and was known as an impulsive maverick. Lillehei and his team launched many surgical innovations during this period, primarily due to their hands-on research experience in the experimental dog laboratories. One site for this research was located in the basement of the Mayo Hospital Building, just three floors below the main operating rooms. 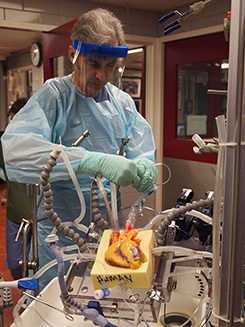 For several years, Richard Bianco&apos;s Experimental Surgical Services group conducted research and evaluation of preclinical medical devices (i.e., cardiac valves) and surgical techniques at this site. Today, this lab space houses the Visible Heart® Laboratory under the direction of Dr. Paul Iaizzo (Figure 3) . Figure 2. 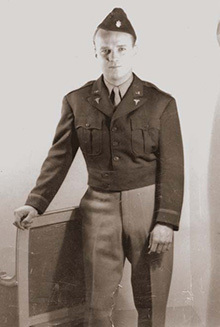 Walt Lillehei in his Army uniform. Figure 3. Photo of the Visible Heart® laboratory at the University of Minnesota.